The Graphic Design process can be a confusing one. We’ve put together a list of frequently asked questions, and a bit of how we handle things. Select the category of your question below, or the search bar on the top right for a keyword! What are Spot Pantone colours? Spot colours are specific colours which are pre-mixed instead of being made up in CMYK (see What is CMYK). The most widely used colour system is PMS: Pantone Matching System. Pantone is a standardised colour matching system, utilising the Pantone numbering system for identifying colours. By standardising the colours, different manufacturers around the world can all reference a Pantone numbered colour, making sure colours match. Very briefly, the resolution of an image or picture describes the detail (or information) an image holds. The higher the resolution, the more detail the image has, because there is more information. Information translates to “pixels,” which are the different coloured “dots” that make up an image. The more pixels there are, the more vivid the image is and detailed to the naked eye. If an image has very few pixels the image will appear to be “pixelated”—the pixels look like squares all joined together—but you know exactly what I’m talking about if you’ve ever printed something off the internet (and who hasn’t?). DPI stands for “dots per square inch.” This is the measurement printing companies use to determine how sharp an image is. Photos or images used for online or web graphics can be at low resolution (72 DPI) and will look FABULOUS on a computer screen. But try to print those same pictures and they’ll look horribly pixelated. For printing purposes images should be 300 DPI or better. What is RGB and CMYK? RGB is an additive, projected light colour system. All colours begin with black “darkness”, to which different colour “lights” are added to produce visible colours. RGB “maxes” at white, which is the equivalent of having all “lights” on at full brightness (red, green, blue). Screens (computer, phone, media player, television, etc are RGB – the pixels have little subpixels that just show red, green or blue. CMYK is a subtractive, reflected light colour system. All colours start with white “paper”, to which different colour inks are added to absorb (subtract) light that is reflected. In theory, CMY are all you need to create black (applying all 3 colours at 100%). Alas, that usually results in a muddy, brownish black, so the addition of K (black) is added to the printing process. It also makes it easier to print black text (since you don’t have to register 3 separate colours). Most printers print in CMYK. Please keep in mind, that you can’t display the exact same colors in RGB and CMYK. This indicates whether the artwork is in a horizontal or vertical format. Landscape means horizontal. Portrait means vertical. When giving the size of artwork is it generally accepted practise to give the height first, followed by the width. All images from digital cameras or scanners are made up of PIXELS. The word PIXEL is a contraction of the term PIcture ELement. A pixel’s appearance can be defined as a tiny square of colour. You may find it helpful to think of it as a very small tile, such as a floor tile. If you magnified a high resolution digital image to 1,600 percent you would see the pixels (or tiles) that the image is made up of. Whats the difference between Litho and Digital printing? Litho printing has been around for ages and even with the advent of digital printing, it still remains a popular choice amongst many business owners. Litho printing involves creating custom plates for each page and the machine uses oil and water (which do not mix) to recreate the images on paper. Litho printing works out to be very cost effective if you require a large volume of prints. One of the drawbacks to litho printing is the initial set up cost. Setting up the plates does require a bit of time and can be expensive if you are printing a small number of documents, which is why litho printing is more suitable for a large quantity of prints. Digital printing is a quicker and more cost effective option if you need less than 1000 copies of something printed. This is because it does not require a lengthy set up process as it simply prints from an electronic file. Digital printing is also a better option if you need each document to be personalised. For example, if you are printing notices and you would like each addressed personally to your customers. One of the disadvantages of digital printing is that the prints are usually not protectively coated. This means that UV, heat or moisture can damage the print quite easily, which is why litho printing would be a better choice for outdoor banners and posters. Quantity and cost: Litho printing is a better option if you are printing more than 1000 copies of something. Digital printing is a more economical option if you are printing a small number of documents. Quality: Litho printing is known to produce a much better quality image than digital printing. Speed: The set up needed for litho printing can take quite a while. Digital printers are set up easily and your job will be completed quickly. Which is the best printing option for me? The ISO paper size A standard is based on each size being half of the size of the previous one, when folded parallel to the shorter lengths. This system allows for a variety of useful applications, such as the enlarging and reducing of images without any cutoff or margins, or folding to make a booklet of the next size down. 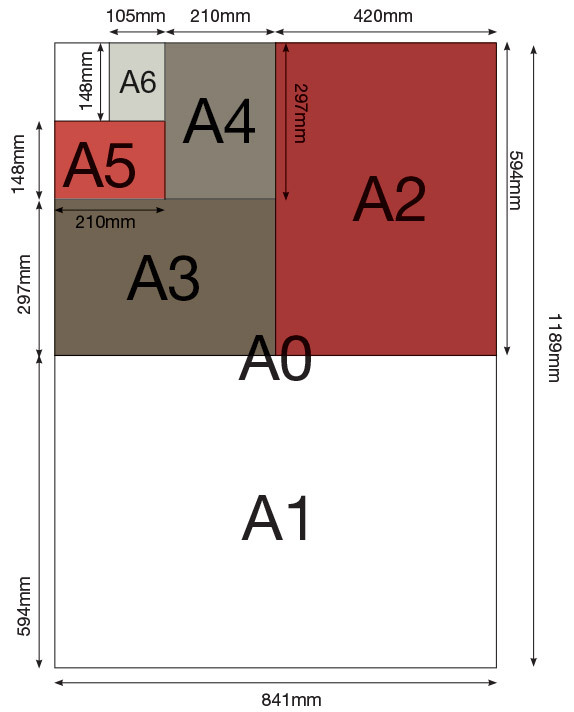 The diagrams below show the A page sizes in comparison to each other and with their sizes (click to open full-size). Are the correct words capitalised? (Names, places, months, weekdays). Are there words that have been unnecessarily capitalised? The term i.e. means “that is”; e.g. means “for example.” And a comma follows both of them. We keep timesheets of all our projects, which can be supplied if there is a query. We use an online application which allows us to generate reports on demand. We can also set time alerts, so you will always be aware if a project is experiencing time scope creep. We will advise you as soon as it reaches a pre-determined time milestone. Our system prompts us if we leave the timer running, so you can rest assured you aren’t being charged for time that is not being spent on your job. We have a double-checking system in our studio in an effort to make sure that your work is as problem free as possible. Although Halo Media will do our best to ensure that your work is error free, the final responsibility is yours to ensure that correct spelling, grammar and contact details appearing on your final work is checked and approved prior to Halo releasing your artwork. If we are not brokering print, then the onus is on you to ensure that your printer runs proofs and they are signed off prior to printing to avoid print errors. Check your images are high resolution and do not have any copyright restrictions. We require all content in digital format unless agreed otherwise. We require text supplied in Microsoft Word or email. Please ensure that it is your final version and is free from spelling and grammatical mistakes as Halo Media will not be held responsible for mistakes. Furthermore, content changes may incur extra costs (see how to avoid scope creep) and increase the likelihood of errors. If there are other people involved in the project, please obtain their approval prior to sending content through. All images supplied in high resolution (excluding website imagery) and logos as vector based artwork or high resolution jpegs. If we need to redraw logos and graphics, this may incur an extra fee. Should you not have imagery, we can source images for you from our standard image libraries at an additional fee, or assist with assigning a photographer (to be billed separately). Note: You need to ensure that you have copyright compliant imagery and content. This means you cannot take the pictures from Google, or copy the content from another website. Halo will deem all supplied imagery and text to be copyright compliant and will not check for plagiarism or piracy. If you are unsure, please check with your Halo contact to discuss this further.